It makes people happy when you are into food. I know this because I once took a cupcake menu from my favorite bakery in Seattle to a work retreat and during breaks read aloud the different flavors to whoever was sitting next to me. This was (a) a way to assess and make new friends (Were they a vanilla or a chocolate person? A flavor of the month kind of gal or a classic guy? A friendly vegan?) and (b) a way to get at the things that got them most. Food can do this. Maybe the way good buttercream hardens to the touch doesn’t get you real animated like it does me. Or maybe the thought of lavender buds in your cake seems like soap in the mouth. What does then, in the words of Mary Oliver, “kill you with delight”? Be specific about it. Be an evangelist for it. We need your delight in the world. 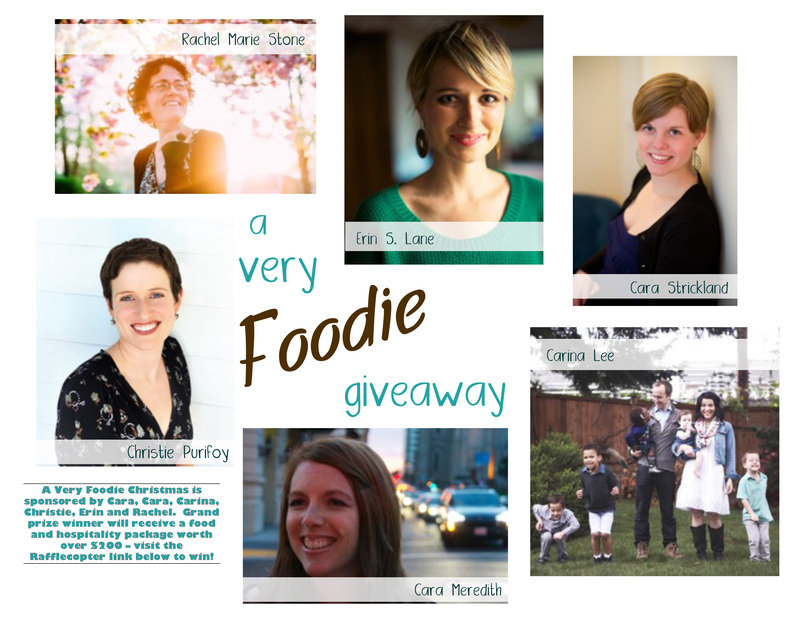 That’s why I’m geeked to participate in a very foodie giveaway with five other talented lady bloggers. Foodies, in my book, are not people with restrained or snobbish taste. Instead, we are like dogs on the hunt for delight, noses to the ground and mouths slopped with drool. We take pictures of our food. We dedicate blogs to our food. We fight with TSA agents over whether frosting is a liquid or a gel and when they say it’s a cream and we aren’t getting through security with 12 oz. of it, we scoop three quarters into the garbage using our bare hands and the bottom edge of a travel-sized shampoo bottle. 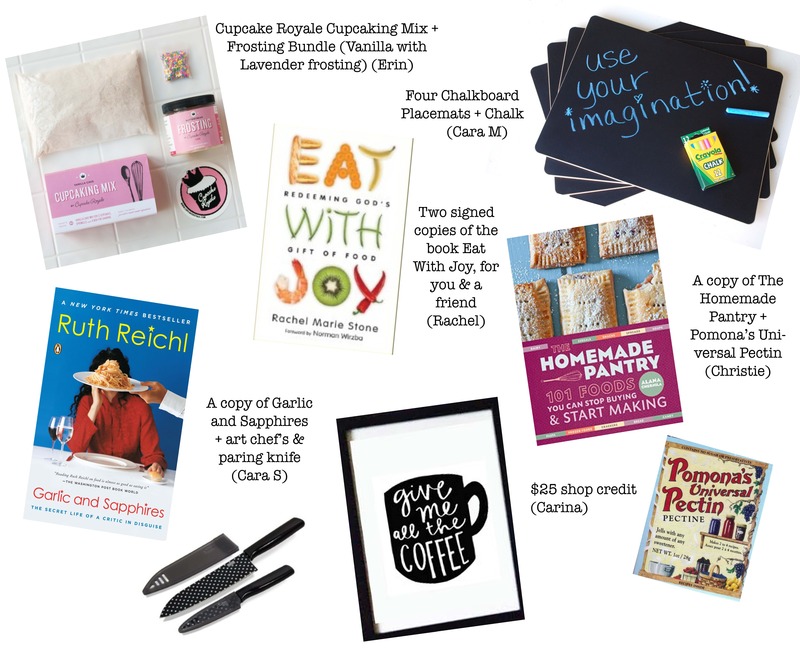 One lucky winner will receive a grand prize of over $200 in foodie products and paraphernalia (including a 12 oz. jar of said buttercream.) To enter, click the Rafflecopter link below. The more of us you follow, the more entries you get. It’s a chance for us to share our delight with you. And it’s a chance for you to delight in getting to know us. Christie Purifoy earned a PhD in English literature at the University of Chicago before trading the classroom for an old farmhouse and a garden in southeastern Pennsylvania. Her first book is forthcoming from Revell. You can connect with her on her blog, Facebook, and Twitter. Rachel Marie Stone is a writer living near Philadelphia. In the past eight years, she has lived in four countries and two states, and will gladly tell you about the various kinds of pizza she ate (or didn’t eat) in each place. Her book, Eat With Joy, won the Christianity Today Book Award for Christian Living. You can connect with her further on her blog, Twitter, and Facebook.